Splosh for the Billabong begins at a shady bend of the river during a northern Australian day. There are animals and plants to observe in and around the billabong, and when the rain comes and goes, there is mud to squelch in, mud to draw pictures with. The text is simple, with strong verbs and stylised colourful images. The text is repeated on a final opening, in English and in Yanyuwa, a local Aboriginal language. 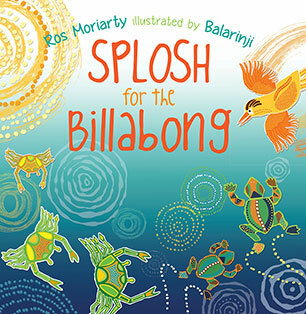 Splosh for the Billabong is a perfect read-aloud text that could then be acted out. Children will be acting out the sounds, before making their own mud and creating their own images of the billabong. Animals and plants of the billabong environment are introduced, simply and effectively, as is the concept of image-making to tell stories. ‘Splosh for the Billabong’ offers young Aboriginal children a chance to see their own world reflected in story, and all children the opportunity to ‘visit’ a billabong. Recommended for pre- and early-schoolers. First…the land wakes in morning light. 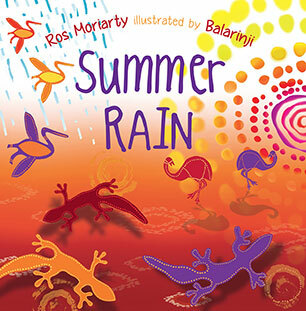 Ros Moriarty and Balarinji present a northern Australian summer’s day. Summer Rain begins with dawn, and ends after the sun is gone. A summer rain shower increases the steaminess, and animals appear to crawl, stretch and swim. Illustrations are stylised and brightly coloured. In the final story opening, dancers appear to enjoy the cooler evening. In the final opening, the text is written in English and in Yanyuwa language. Verbs appear in a larger coloured font. Summer Rain is a gloriously coloured dance of a story, sure to be acted out in kindergartens and early primary classrooms. It provides an introduction to the climate in the north of Australia and to some of the plants and animals who live there, both on the land and in the sea. Young readers will recognise the animals and plants. Summer Rain is a delight, sure to be a hit with local readers who recognise their own world, and other readers everywhere. Recommended for pre-schoolers and early years students. ‘Ten Scared Fish’ is a counting book, 1 to 10, but it’s also an introduction to some fish and some animals the fish might encounter in their travels. The text follows the journey of fish from the waterhole to the sea. Ten Scared Fish is a counting book, 1 to 10, but it’s also an introduction to some fish and some animals the fish might encounter in their travels. The text follows the journey of fish from the waterhole to the sea. Along the way, there are hazards, but the fish keep on swimming. Illustrations are bold colours and simple shapes, combining traditional dot painting with more representational-style images. The cover hints at the final opening, but it would be interesting to see how many readers work it out on first reading. The final opening has the story translated into Yanyuwa language. Part of the income from sales of Ten Scared Fish will support indigenous preschool literacy programs. It’s a lovely counting book with a simple story. It’s easy to imagine it being used with very young children to open discussion about many things. First there’s the counting, then there’s the landscape and some of its occupants. And there’s also the opportunity to begin the story of this land’s oldest inhabitants and their storytelling. Recommended for preschoolers. ‘Kangaroos Hop’ is a simple, cumulative tale of animals and the way they move. First the reader meets the kangaroo and his movement: he hops. Kangaroos Hop is a simple, cumulative tale of animals and the way they move. First the reader meets the kangaroo and his movement: he hops. Gradually other animals join the journey, all moving in their own special way until finally they reach their destination. And yes, there’s a surprise. Illustrations are stylised and colourful, simple but carefully drawn as is the landscape they travel. Kangaroos Hop is a companion title to ‘Ten Scared Fish’, and both are aimed at the younger set. Part of the proceeds of sales will go to indigenous preschool literacy programs. To say these titles were just for an indigenous readership would be to short-change them. They would be a fabulous addition to any home or preschool library. Each provides a springboard for discussion on many aspects of life in Australia, both rural and urban. Recommended for preschool children.